I previously mentioned these, but I thought about it some more and went ahead and wrote an R implementation. With very little work you could rejig this code to display all kinds of 3D bar plots; I’ve commented the code thoroughly so it should be easy to follow. Immediately below is an example plot and below that is a gallery comparing an original plot by the Broad Institute with two versions produced by my code. I wouldn’t want to slavishly copy, so I’ve added an optional transparency effect that is both useful and attractive. It was essential to include the lit=FALSE argument when drawing surfaces, as the default lighting makes everything look very shiny and pretty ugly. I also had to change the field of view (FOV) to 0, as the default value gives a slightly wall-eyed view. The scalexy argument scales both the “fatness” of the columns and the gaps between them. Scaling z using the scalez argument is useful if your data is very flat and you want to emphasize it. It will have knock-on effects on the scale that appears at the side, so be careful. If you’re going to transform your data, it’s probably best to do so before putting it into this function. The alpha transparency I added to the column sides is very useful for viewing columns that are obstructed by other columns and has the added benefit of looking pretty cool. I haven’t included the wireframe axis background, I leave that as an exercise for the reader, or maybe I’ll add it later. Code is available below and example data is included if you check out my GitHub here. ## Note; would it have killed the original author to comment their code? ## Draws a single "column" or "stack". 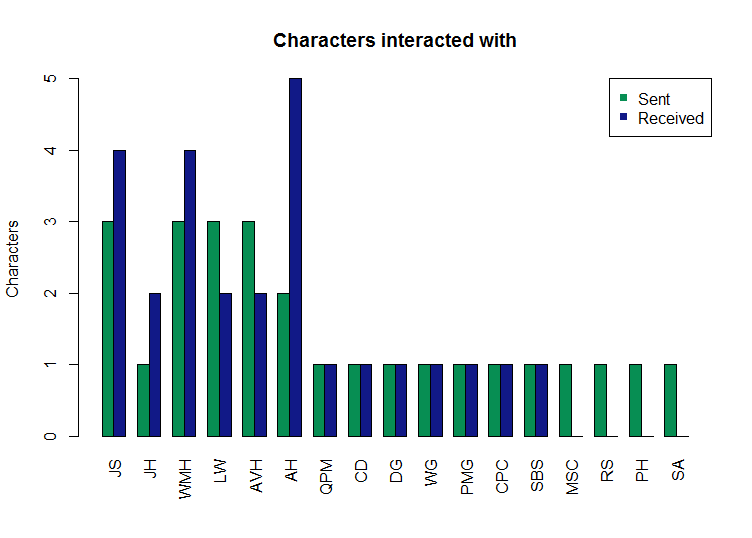 There has been a trend in the last few years to put interesting-looking but non-informative figures in papers; the pie chart is the worst recurrent offender. I have no idea how they keep getting included, as they’re famously misleading and awful. I want my work to look as much like the cockpit of a mecha or Iron Man’s HUD as possible, but I know that it’s not going to be as clear or concise as it should be. Figure 2 is confusing at best and reproduced below. These pie-chart-like plots were made famous by Florence Nightingale 150 years ago and have been called “coxcomb plots”. Wikipedia claims that that’s a mistake and they are really called “polar area diagrams” or “courbes circulaires”. Use barplots or boxplots. Yes, they’re boring, but they’re also familiar and easy to read. I suppose you could even put a scale at either edge and mix data types without too much complaint (e.g. somatic VAFs and copy number logRs on the same plot). 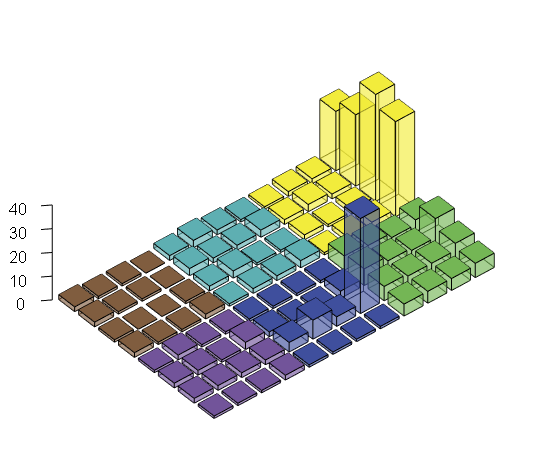 A type of 3D barplot. 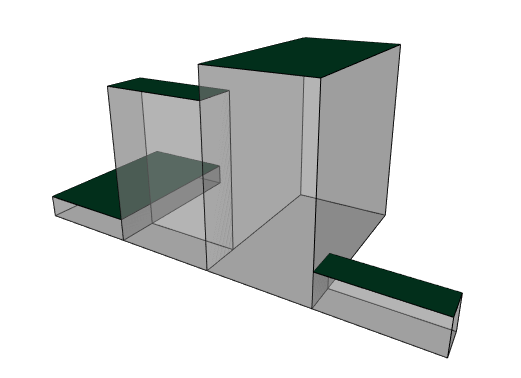 I generally think 3D is a bad thing when displayed in a 2D plane, particularly if it’s non interactive. For example, a 3D shape on a 2D display is fine if you can rotate and zoom it freely. “Lego plots” have been popularized by the Broad Institute in their sequencing papers, usually to show the sequence context of mutations (see below; taken from Exome and whole-genome sequencing of esophageal adenocarcinoma identifies recurrent driver events and mutational complexity by Dulak et al, 2013). The irony of the pie charts isn’t lost on me. They’re relatively appealing and a relatively concise way of showing what would otherwise be a barplot of 96 values; it would get tricky if the data weren’t carefully arranged so as not to obscure anything, though. If 3D barplots are now acceptable, why don’t we make a 3D barplot that encodes two variables? 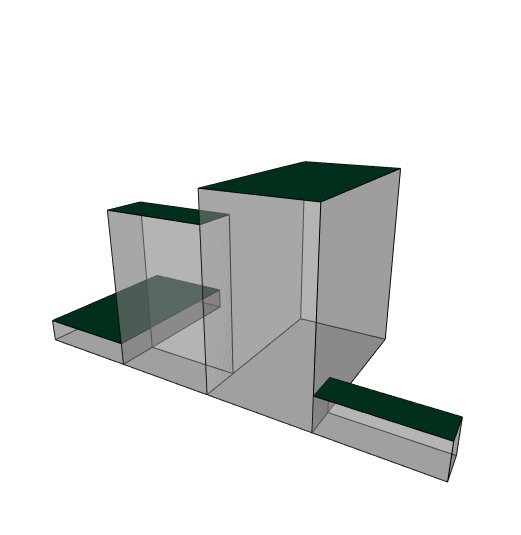 The height would represent one variable and the depth another. 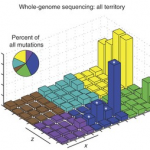 The data set represents 4 mutations (labeled A to D) in a set of 100 samples. Each sample has a variant allele frequency (VAF) for each mutation, between 0 (not present) and 1 (every sequencing read contains it). Coxcomb / polar area plot. Arc length represents proportion of samples, radius (wedge length) represents median VAF. Can be difficult to interpret. Boxplot. Good representation of the data, but hard to tell how many samples are represented. For example, B is far less common than C but appears to be very similar. 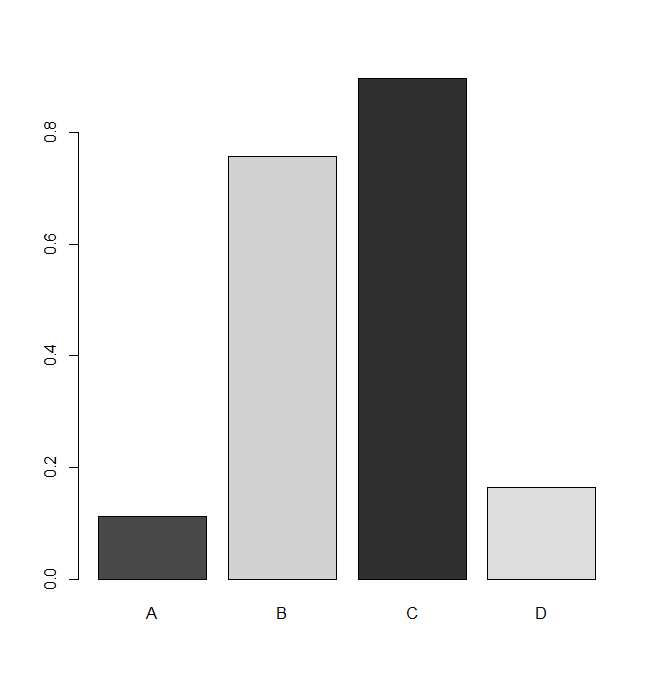 Likewise for D and A.
Barplot. No representation of the spread of the data. The proportion of affected samples is encoded using colour (darker mutations affect more samples). 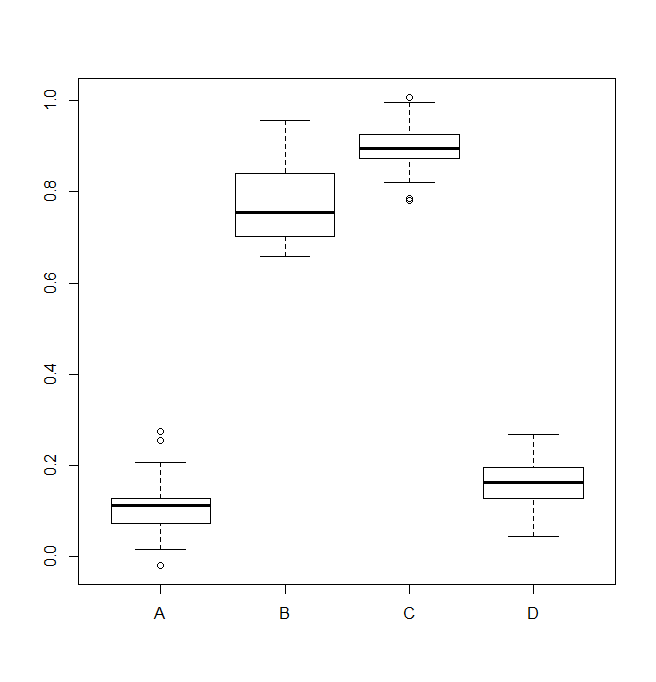 Perhaps the colours could be applied to the boxplot for the best result? 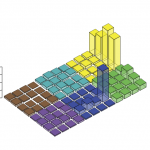 3D barplot. It’s very basic (missing axes and labels), but shows the relationships between proportion and VAF more clearly than other plots. I added some transparency so no column totally obscures any others. 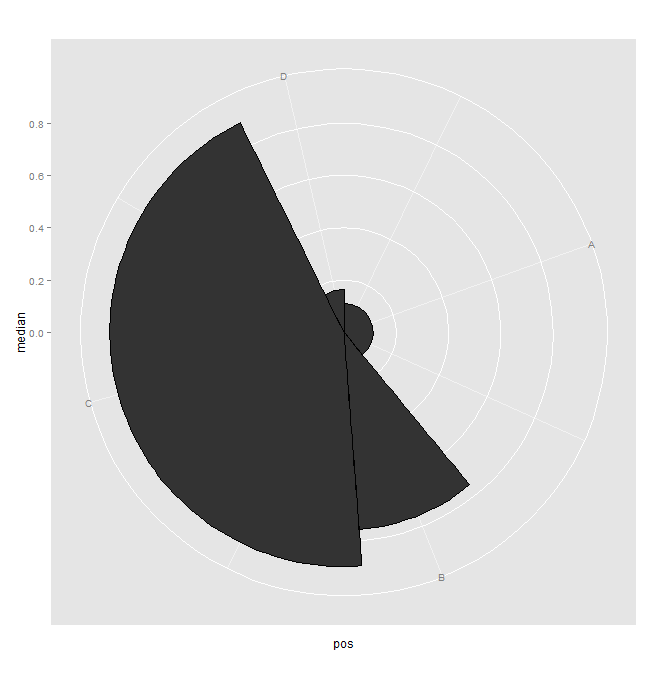 It’s more convincing when you can rotate the object yourself (download the code and try it yourself), but I think even a static image is better than a Coxcomb/polar coordinate plot. Code is below and available on GitHub here. ## Would it have killed the author to comment their code? I discovered unpredicted behavior when intersecting GRanges objects; this is how to avoid the same problem I found. Maybe my intuition wasn’t good, but this represents the a bad type of bug; a silent one. If I had not spotted it, I would have lost several nonsynonymous KRAS mutations in my dataset. If you want to represent a long list of genomic coordinates in R, you probably want to use a GRanges object. It’s a very space and time efficient way of storing the data, even if it can be a little difficult to get accustomed to. It’s ideal for representing bed files, aligned sequence data, SNV and indel coordinates, annotations and so forth. In my case, I was intersecting two GRanges objects; I wanted to see which of my SNVs were within the boundaries of an exome capture kit. In the example below, we use three exome capture regions (one from chromosome 1, exon 2 of KRAS and one from chromosome Y) and three consecutive SNVs i.e. SNVs that occur at immediately adjacent positions. I could have just used exon 2 of KRAS, but I wanted to demonstrate the code can handle multiple locations on different chromosomes at once. The SNVs could be in the same sample or different samples, it doesn’t matter; what matters is that their coordinates are contiguous. The contiguous SNVs are collapsed into a single window (which is undesirable), then the regions are expanded back to single base-pair sites. You of course can’t do this with indels of longer than 1bp. We could have avoided this bug entirely if we’d worked in reverse and used setdiff() instead of intersect() to identify SNVs that don’t fall within the exome. ## Intersect the SNVs with the exome. ## You DO NOT get five hits back, but three. ## and paste the appropriate chromosome to it, separated by a colon. ## output back into its components and rebuild. 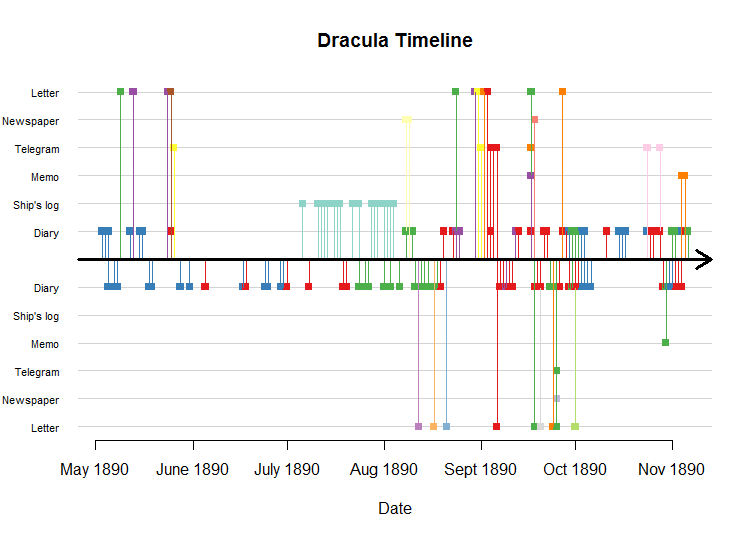 I recently read Bram Stoker’s Dracula, mostly because I wanted to rewatch the 1990s movie of the same name and see how badly they’d mutilated the story. [Update 26/04/2015: I rewatched the 1992 movie and while it’s the most faithful version to the book, it has some weird additions and is utterly appalling. People have been mean about Keanu Reeves’ performance, but he’s no worse than anyone else and the direction is the real issue. The Annie Lennox song at the end is nice, though]. The book is wholly composed of diary entries, letters and newspaper clippings. This means that it’s effectively a self-contained social network, with every “sample” having a date, an author and an intended recipient. It occurred to me that it might be interesting to look at these data and nobody else seems to have done so. Fortunately, someone had tabulated much of the data, even if they hadn’t done anything further with it. Therefore, thanks to Harold J Hotchkiss for typing it up over a decade ago. Obviously not. The year it takes place isn’t important, but it was published in 1897 and ends with a note dated “7 years later”, so let’s assume it takes place in 1890. 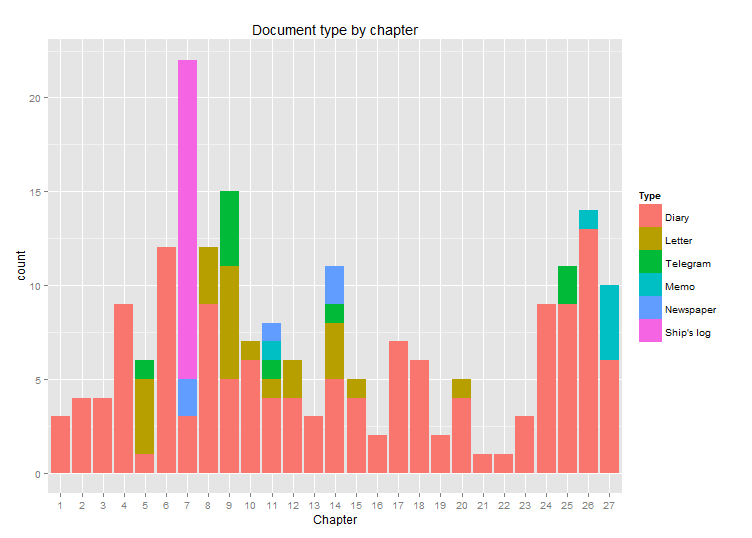 If you calculate the days of the week that events occur on throughout the book, you get the plot below. I have no empirical evidence to back this up, but it looks too evenly distributed to me to be real. I’ve looked at real time series before and you will generally see some sort of trend, be it for weekdays, weekends or a particularly day. As it says in the book, “denn die Todten reiten Schnell” (“for the dead travel fast”) and they apparently don’t take days off, either. ~70% of the book is diary entries chiefly written by 3 authors. 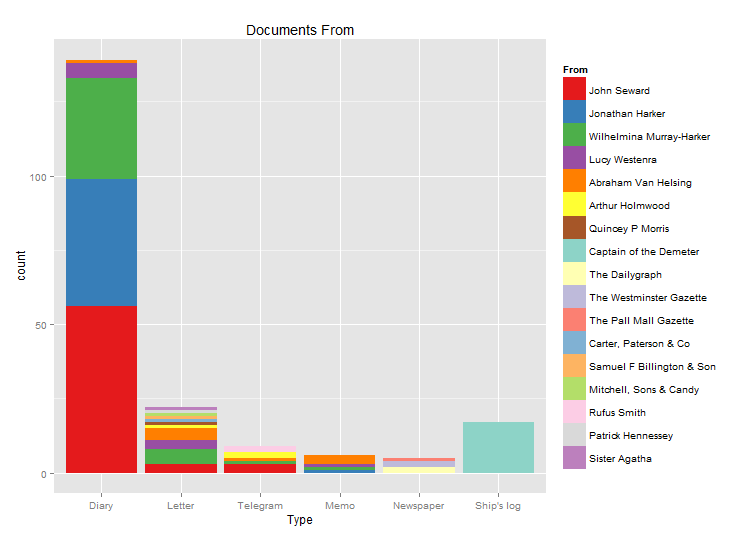 John Seward (~40% of diary entries), Jonathan Harker (~31% of diary entries) and Wilhelmina “Mina” Murray-Harker (~24% of diary entries). Mina gets a double-barreled surname because she marries Jonathan midway in the book and changes her surname, which was the style at the time. I needed a single name to refer to both her ‘states’. There is some truly incredible sexism in the book, it seems like gender was a big deal in the late 19th century. You can divide documents by the type (e.g. letter, diary entry, etc) and also both who they are sent by and to. 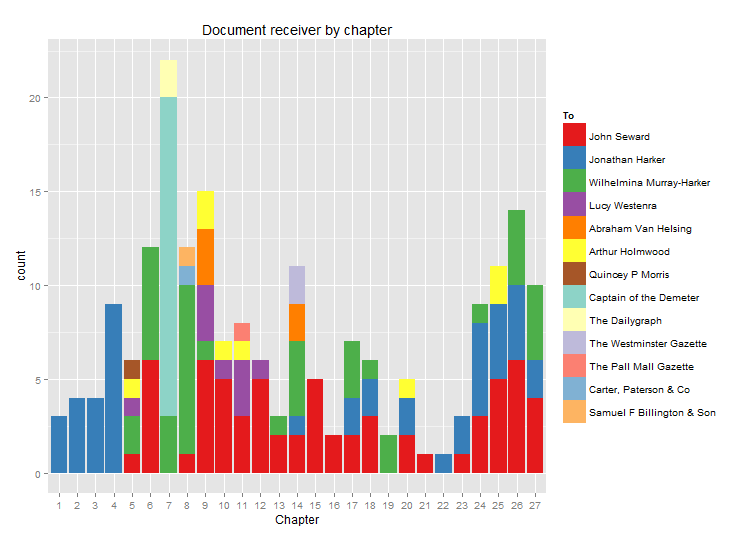 The above figures are global summaries of the entire book. What is happening over the course of the book? This is slightly complicated because the book isn’t in strict chronological order; chapters may feature letters and events that occurred previously. The figure above gives a clear view of the structure of the book. The plots below show who is writing what and to whom. The first few chapters are Jonathan Harker’s diary of events in Castle Dracula, before a flurry of letters to introduce most of the rest of the characters. Subsequently, the captain of the Demeter gives his account of bringing Dracula to Whitby (summary; not a lot of fun), and then Dr Seward gets on with the business of writing the majority of the book. You can also clearly see how certain characters come and go; for example, Lucy Westenra’s death and Jonathan Harker’s heroic reappearance in the second half. Barplots are great, but there other ways to represent the data and they can show structure that hard to grasp in any other way. The above plot is a timeline of events in the book; it takes place in a mere 7 months. Events in odd-numbered chapters are above the timeline and those in even-numbered chapters are below. 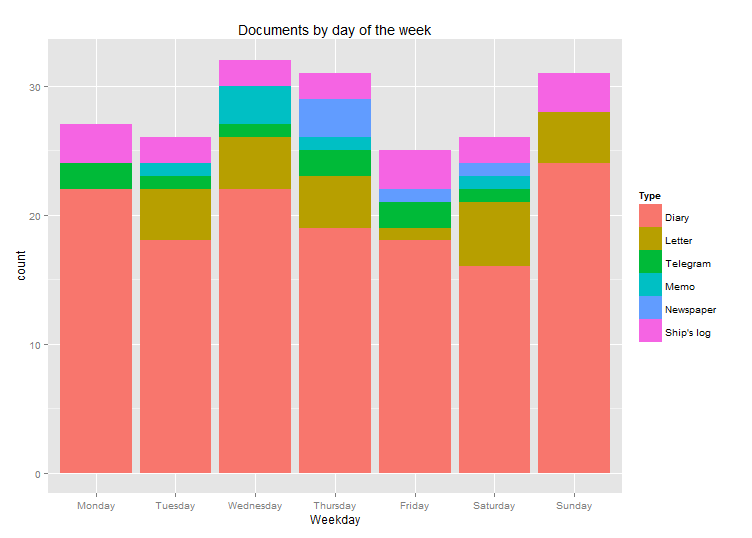 An arbitrary Y-axis separates events by their document type. 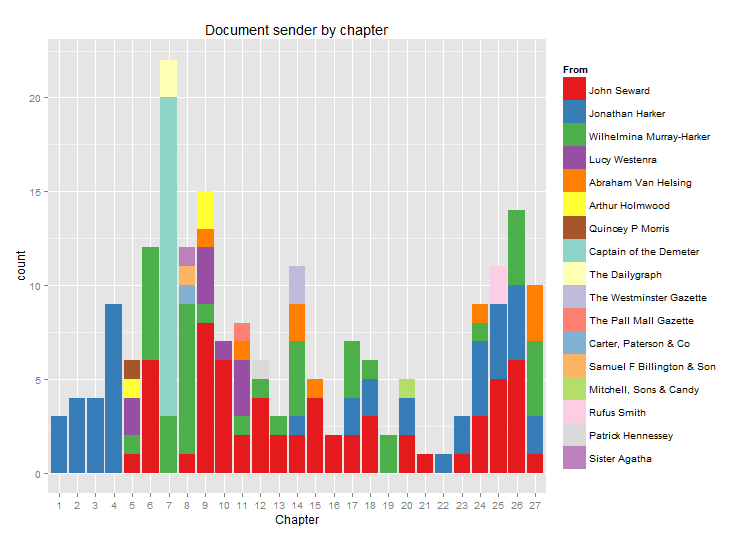 Events are represented by coloured squares corresponding to the sender of the document, with the colours matching those used in other plots here. We’ll start with the most interesting figure, the network itself. 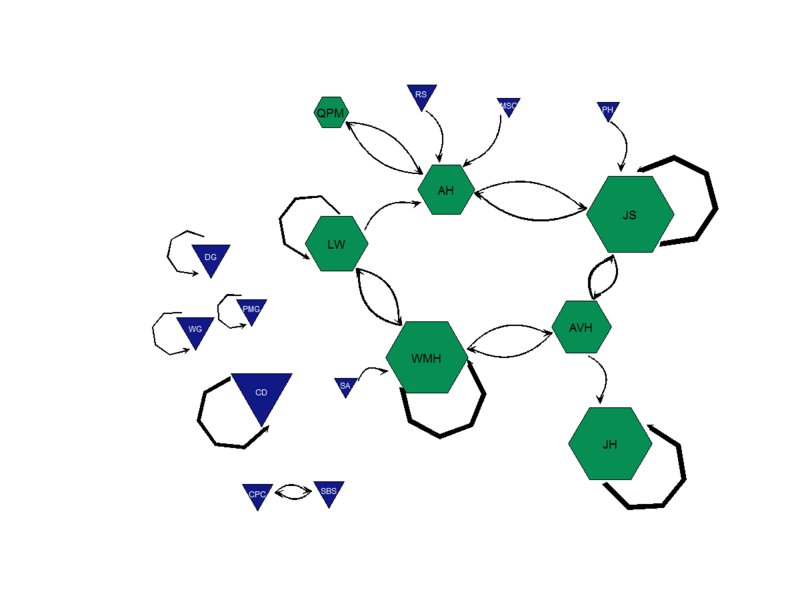 Primary characters are green hexagons and secondary characters are blue triangles. Nodes are labeled with character initials and scaled relative to how many documents they sent or received. Edges between nodes are also scaled relative to how many documents are sent. 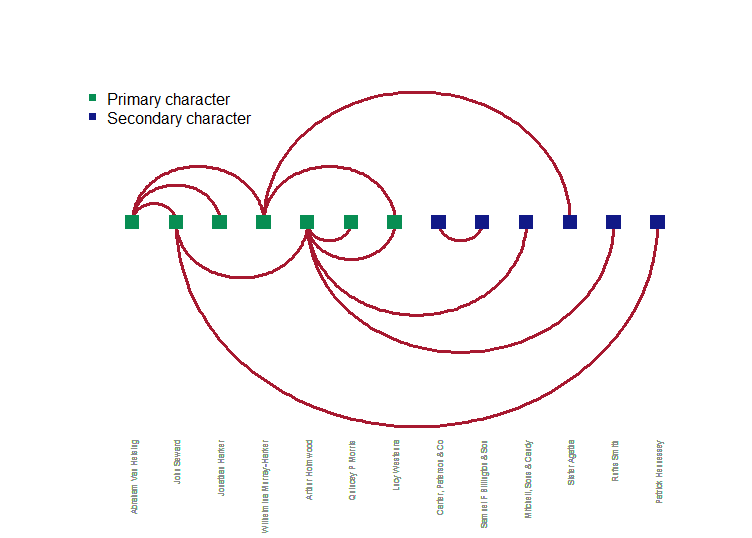 Below is a barplot of how many characters each character sends and receives documents from (this is a summary of the edges in the network above). It includes self-edges, so people who write only to themselves still “receive” at a value of 1. 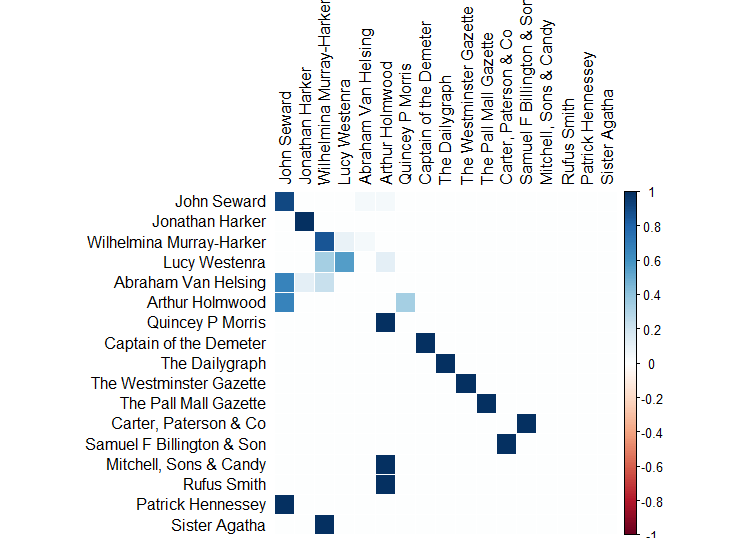 It further illustrates the fact that Arthur Holmwood is the most popular girl at school, whilst Jonathan Harker is a weird, angry loner who talks only to himself. Van Helsing is nice enough to write to him… once. I have also produced a correlation plot, although the data plotted are not correlation values. 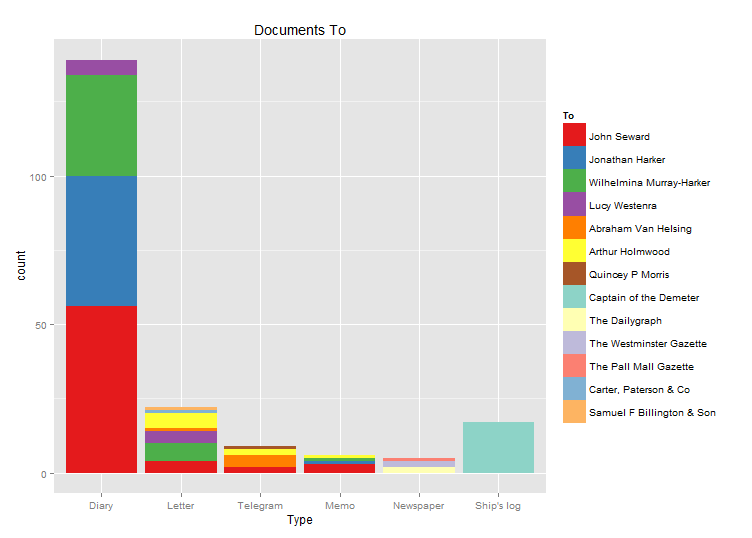 It shows the proportion of documents each author sent to each recipient. The scale is misleading, as all values are non-negative (i.e. between 0 and 1). I find it sad that Van Helsing likes to write letters and never writes in his own self-absorbed diary, but people don’t write back. The Y-axis is sender and the X-axis is recipient. By all means go nuts and do some sentiment analysis or something more complicated, but I was happy just to create the obligatory word cloud. They’re not really empirical, but they can be nice to look at, I guess. 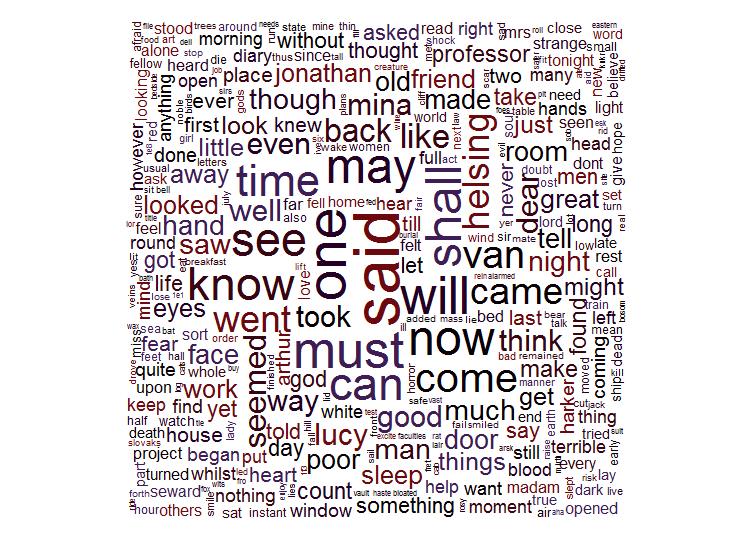 The most common word is “said”, because the book is a “he-said-she-said” bonanza, like all social networks. very clumsy about the waist. It can just about be forgiven for its time, as Mina is ultimately instrumental in defeating Dracula and has a central role in events overall, even if she eventually becomes a bit of a damsel in distress. On the other hand, if you wrote a vampire novel today, it would be unforgivable to have a female protagonist willingly submitting to all kinds of demeaning emotional and physical abuse… wouldn’t it? Perhaps the strangest thing about the story is the way they combat and defeat vampires; on the one hand, the most potent weapons against them appear to be herbs and Christian mythology (particularly bits of magic wafer), all of which is treated with absolute po-faced seriousness. On the other hand, while vampires seem to be averse to these things, but are not physically harmed by them. They are susceptible to ultraviolence, though, as stabbing a vampire in the heart and sawing its head off is pretty effective. Maybe the power of prayer is overstated. The next time you suspect that you’re in the presence of supernatural being intent on giving you immortality (although there are some downsides), try warding them off with a Kit Kat before you decide to brutally murder them, which will be frowned upon if they’re not actually one of the undead. You can access the code and files used on my GitHub repository, but the R code is copied below if you’re interested in a quick look at how the plots were made. You can download the book itself for free from Amazon, and also a nice text version from Project Gutenberg. Now that you have the basics after part 1, let’s look at something more complicated; the second column of the main body of BAM files, the bitwise flag. This isn’t simple. Both the samtools manual and even the SAM specification ostensibly explain what the flag is, but do so in a really opaque way, a sort of “if you have to ask, you’ll never know” situation. The bitwise flag looks like an integer, but it’s not. You might see “99” or “147” and think it’s a score of some kind, but it’s actually a binary encoding of a hexadecimal value. The data stored in this flag is crucial, including things like if the read is a duplicate or doesn’t pass quality controls. The primary effect that this has is that you can kiss goodbye to doing anything complex with BAM files using standard command-line text parsing tools. If you want to really understand what is encoded in your BAM files, you’re going to have to get serious and become familiar with the samtools API, or some interface to it. More on that in the next part. If you want a specific flag explained, you can use this handy calculator. But where are those values coming from? To arrive at the final value, we just add the TRUE values together; you can see how easy this is when the binary hexadecimal values are stacked vertically. Any FALSE values are ignored, as they are zero. You should see a lot of pairs of reads with 99 and 147, and also 83 and 163, which is the same but with the reads in the opposite orientation. I would advise against trying to parse SAM flags as decimal values and adopt a nice programmatic way of accessing them, which I’ll write about next time. SAM and BAM files are considerably more complex than they first look. The SAM format specification hides the complexity well and it is easy to deceive yourself into doing the wrong thing. That document is worth reading, but I will try to simplify it further here. SAM files (Sequence Alignment Map) contain short DNA sequences aligned to a reference genome. BAM files are simply the binary version, which means that they are compressed and about 1/3rd the size. A SAM file is just a text file and can be read by anything; a BAM file can only be accessed by using particular software; e.g. samtools. The body of the file is where the aligned data is stored. There is one row for every read. Therefore, if you’re looking at paired end data (e.g. Illumina sequencing data) there will be two rows for every pair; one for the forward read and one for the reverse. There are at least eleven columns in each row. There may also be further tags appended at the end of these to denote extra data, like mapping scores, RG tags and so forth. Next time, we’ll look at the bitwise flag in more detail, as this is a major source of confusion. I was sceptical (not a typo, I’m British). Who wouldn’t be? I’d invested literally hundreds of hours into my sequencing pipeline which depended almost entirely around GATK and even recently re-tooled to accommodate the sweeping changes brought by GATK 2.0 and it’s great, truly. However…. I had been enviously eyeing up MuTect for quite some time, as it was always built from the ground-up to serve one of the purposes I am currently knee-deep in; finding mutations in tumour-normal pairs. To be clear, I mean comparing sequencing data from a tumour samples with a normal sample from the same patient. On the other hand, I gather GATK has its roots in GWAS studies and has always been more population-focussed. The problem we’re all wrestling with currently – which, by it’s very nature, is never going away – is intraclonal heterogeneity, the idea that cancers are not monocultures of billions of copies of the same cell, but are highly heterogeneous mixes of potentially thousands (millions?) of individual clones, all of which are descended from (probably) one originator cell. These clones compete with one another for resources in their niche and are effectively locked in an arms-race with one another, as well as with the host body. Cancer patients are not facing a single entity, but a legion of cells that reinvent, mutate and transfigure themselves in the best Darwinian tradition. I guess if these cells are from a monocellular and therefore easier to purify population of cells (as is the case for myeloma – you can isolate tumour cells by selecting for CD138+ cells), that’s not terrible news; but what if your sample is a solid tumour? Who knows what kind of structural heterogeneity you need to contend with? Still, your sample is “bulk DNA” and is a sampling of potentially thousands of separate genomes compressed into a single readout. I’m sure I’ll post more on the subject at a later date, but for now let’s say that it’s a definite issue. 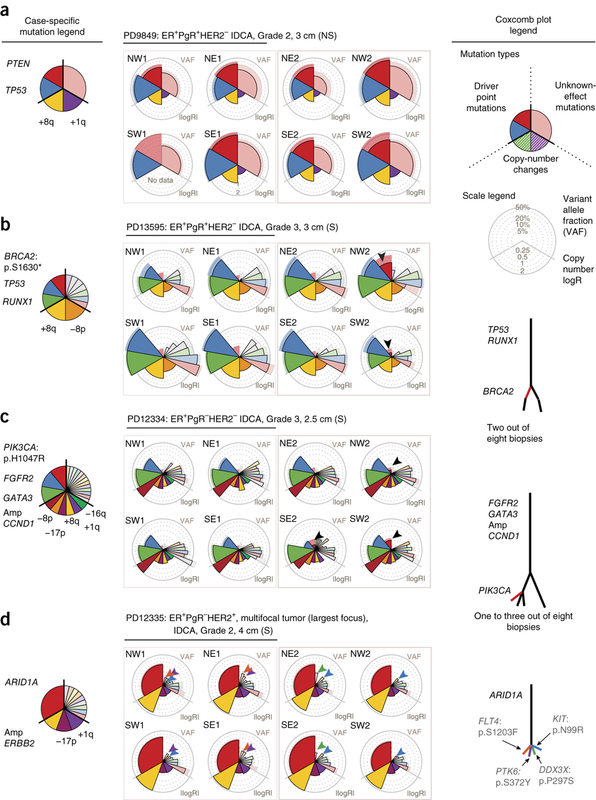 In a homogeneous population of cells, SNVs (single nucleotide variants) will be present in all cells, but this will not be the case in a heterogeneous population of cancer cells. MuTect’s real power lies is its ability to detect these subclonal mutations. The detection is limited mostly by the depth of the sequencing, with quickly diminishing returns – supplementary table 1 in the MuTect paper does a good job of illustrating this, particularly if you turn on conditional formatting in Excel to turn the table of values into a heatmap. Everybody loves conditional formatting! MuTect’s output is not without issues, but I’ll discuss further filtering of the output next time. Finally, it’s worth noting that YES, MuTect does output in VCF format… it’s just undocumented. If you ask very nicely in their forums, the authors will help you. I like Perl a great deal; it’s ideal for almost any task that can’t be achieved trivially on the command line with a few pipes and some awk. Perl is fast and easy to write, and it’s perfect for text editing and tying other bits of code together. You could even use it as a flexible wrapper for bash commands and scripts, as I have mentioned before. After checking for obvious causes like stray zero values or NAs, some debugging revealed that Perl was failing because I was attempting a t-test on a pair of arrays of length 4710. I wasn’t passing in any illegal values, it was failing purely because the input was too big. There’s no way I’m going to accept that when a desktop PC running R can perform t-tests on arrays orders of magnitude bigger. I decided to solve the problem in a memory-hungry fashion in R for the time being and to be fair to Perl, haven’t attempted to write the same code in Python, but as Python famously has both NumPy and SciPy which are written specifically to augment the inbuilt maths functions, I’m optimistic that it won’t fail me. TL;DR don’t use exclusively open or closed source software, you should use whatever is required for the job. Windows 8 has just been released and by gum, I like it. Now is probably a good time to briefly discuss the open versus closed source software debate. I’m probably unusual in that my life is starkly divided in two when it comes to my interaction with software whether I’m at work or play. At work, I often want and even need to see the source code. What sort of input does the program want? Why exactly is it throwing that error? Maybe it needs to be compiled differently for whatever particular hardware or version of Linux I’m using. This is because I often need a deep understanding of what code does, because I’m trying to solve particular problems in particular ways. I use R a lot and one of many excellent features is that you can type a function name and the source for that function will appear. It helps you develop and debug your own code much faster. This means that an open-source environment is essential. Tinkering with code (and indeed the entire Linux OS) is a very desirable feature. I can barely imagine the horror of having nothing but pre-compiled closed-source software to work with; it would be an abomination. That’s not to say that I don’t enjoy coding in my spare time. All I really miss about my nice super-powerful hardware from work when I get home is the command line. A nice GUI is excellent, but sometimes you want to do things that a GUI just can’t. I used to feel that way, until I summed up the courage to learn Windows PowerShell, which is mostly Unix-like commands, anyway. It’s not bad, if you’ll excuse the fact that you still have to horizontally resize the window manually (i.e. no click and drag) and the utterly terrifying error messages. Or you could make your life really simple by installing MSYS which is most of the useful command-line Unix utilities ported to Windows. 6 full lines? That’s pretty verbose, don’t you think? I also use Windows at work (Windows 7) and find it to be the most efficient desktop environment for me, but each to their own. I’m happy provided I can install an X-windows client (Xming) and a terminal (PuTTY). Much of the rest of my working life is creating and editing MS Office documents, so why would I want a Linux desktop? I want to juggle different and ever-changing distros and even window managers (Xfce? Gnome 3? KDE? Unity?) like I want to juggle chainsaws or bake my own bread. Not at all. All I’m really saying is that even if you really passionately believe in open-source, there is nothing wrong with paying for closed-source software – it doesn’t make you a slave anymore than open-sourcing your code makes you a hippie. You can have your cake and eat it. The ICR (note fabulous new branding) organised a half-day seminar on “GPU Acceleration in Bioinformatics”. NVIDIA were kind enough to sponsor the event, which meant flying speakers in from as far as Russia and Hong Kong. Thanks, NVIDIA! All computers contain at least one processor, the CPU (central processing unit), but many also contain a specialised secondary processor which is geared toward doing the calculations necessary to produce graphics quickly, the GPU (graphics processing unit). Although these may be embedded on the motherboard of your PC (or even on the same die as the CPU in some cases) for serious amounts of graphical power you’ll need a separate device, a so-called graphics card. The first question to address is why would you want to use a GPU at all? In desktop scenarios, this is easy because many users have a GPU in their machine doing almost nothing most of the time. What if you could make use of all this power? You’ll call it “hardware acceleration”. Microsoft recently posted a very informative article outlining how they’ve baked this kind of GPU utilisation right into Windows 8 to speed up everything from the obvious (3D game performance) to the seemingly mundane (text rendering). Even so, the the majority of the power of a GPU is still largely unused in a desktop machine when not gaming. However, the situation in computational biology is not so simple, as most of my compute is performed on Linux clusters, nowhere near a traditional desktop computer, with no GUI and therefore no apparent need for a GPU. At first glance, you might suspect that bioinformaticians just wanted an excuse to get their funders to furnish them with all-singing-all-dancing gaming rigs, but this isn’t the case at all. GPUs are exceptionally good at performing huge numbers of similar operations in parallel and it just so happens that many of the problems we have in biology (a great example being sequence alignment to a reference genome) are exactly these sort of embarrassingly parallelisable problems. Having established the potential need for GPUs, you need to choose a language; CUDA (NVIDIA specific) or openCL (an open standard). I’m not a computer-scientist, but I am a gamer and I’ve noted that NVIDIA cards tend to be better (for my purposes) than ATi cards, though I’ve only switched to NVIDIA in the last few years. This was partly because I noticed that non-gaming applications I use such as Handbrake (a video transcoder) would be much faster using a CUDA-enabled card. You might count that as anecdotal evidence that CUDA is more widely supported and used when even consumers have heard of it. OpenCL offers hardware-agnostic portability and academics will often vouch for open solutions but as I have a preference for NVIDIA cards, certain apps I like run in CUDA already and anything written in OpenCL would run on an NVIDIA card but not vice-versa… the case for NVIDIA seems clear. SOAP3-dp. A new version of the SOAP aligner has just been released. It looks quite exciting as it now runs on GPUs, running “easy” alignments via two-way Burrows-Wheeler transforms (i.e. it works like BWA) on the GPU and leaving harder reads to the CPU , so much like running Stampy in hybrid mode with BWA, which has been my preferred approach. I guess I need to run some comparisons. On the other hand, I guess we need to get our GPU server up and running, first. Soon. Coincidentally, the very next day I received an automated update from Gerton Lunter that a new version of Stampy had been released. It’s different in two main ways; firstly, it’s now multithreaded so should be substantially faster. Secondly, it no longer runs concurrently with BWA; rather, you align first using BWA and then allow Stampy to realign any poorly aligned reads. You could run Stampy on any bam file, so maybe we might end up using a SOAP3-dp/Stampy hybrid. Who can say? I recently had a disagreement with someone who was using Novoalign, which I gather is much like running Stampy/BWA, but costs actual money. Proprietary hardware and even operating systems? Fine. Proprietary aligners? I think not, at least not without some serious empirical evidence. Unipro UGENE. All the way from Novosibirsk in Russia came Yuriy Vaskin to show off the UGENE software. I’d used it briefly before and have been generally impressed by the sheer number of features that they’ve packed into it – everything from (multiple) multiple alignment tools, a full workflow manager (think Taverna Workbench) and even the world’s only Windows-based implementation of the BWA aligner. I’m very biased toward the command-line and scripting while at work so I’m not sure there’s a place for a GUI-based program in my workflow, but I can certainly see the utility for such software, especially for groups without a dedicated bioinformatician. My interest is not particularly using UGENE as a general workbench, but as an enhanced genome browser. I currently use IGV to view our bam files; users can access data locked away on our Linux servers from their Windows (or Mac, or Linux if we had any of those) desktops as I followed the instructions here (http://www.broadinstitute.org/igv/DataServer); very handy indeed. Users are shielded from a crash-course in SSHing into a Linux server and the data is shielded from the users, who are only human (like me) and bound to accidentally delete or corrupt it eventually. However, sometimes IGV feels both a little ugly and sometimes a bit bare-bones. I guess a short attention-span and the urge for shiny novelty are common issues in the 21st century. In the age of buttery-smooth apps running at 60fps on our smartphones, Java-swing desktop apps do look a bit ugly, but it would be foolish to judge software on “shinyness” over utility, particularly when IGV can be run natively on any platform with a Java Virtual Machine. I was disappointed to discover that on my (fairly wimpy) Intel Core2 Duo workstation with 8GB of RAM UGENE took several hours to index a 14GB BAM file, when I can view the same file near-instantly using IGV and a standard bai index file. Despite this there’s plenty of reasons to recommend UGENE; it’s not a great genome browser, but I feel it’s important to suffix that statement with the word “yet”. Finally, there was some debate over why you should invest so much money in the enterprise-standard NVIDIA Tesla cards when you could feasibly use their much cheaper and consumer focussed (i.e. gaming) GeForce cards. There are several good reasons. While consumer cards are indeed cheaper, this is because they are produced in enormous quantities while attempting to squeeze the maximum profit out of them, meaning that they’re clocked at higher speeds and built from less reliable parts and may even have reduced feature/instruction sets. Even playing your favourite game for 30+ hours a week with all the dials turned to maximum does not compare to the stress a Tesla card might face when consistently hammered with jobs 24/7/365 in a server. It’s the same story with all computer hardware; server hard drives are more expensive because they’re more robust and you are of course also paying for support which you just don’t receive or even want as a consumer. It’s also worth noting that consumer cards have a different form factor and might not fit into a server in the first place or may block the airflow across the system in a catastrophic way. You might build your own compute farm from consumer cards if you were, say, running some sort of Bitcoin mining operation at home, but you’ll really need Tesla cards if you’re doing science or engineering. I suppose you could do some testing and local development using consumer cards, but when in full production you just need to spend the money. You do want an accurate, repeatable answer, don’t you? Thanks to the speakers for making me think, to NVIDIA for sponsoring the event and Igor Kozin from the ICR’s Scientific Computing Team for organising it. Maybe Some rough results when I start toying with GPU-accelerated aligners will show up on this blog at some point?